What is more American than a Harley? The story of Harley-Davidson is a story of 20th century America – the roaring ‘20s, two world wars, the Great Depression, postwar prosperity, social upheaval, economic malaise, the rise of big money and the economic power of baby boomers. 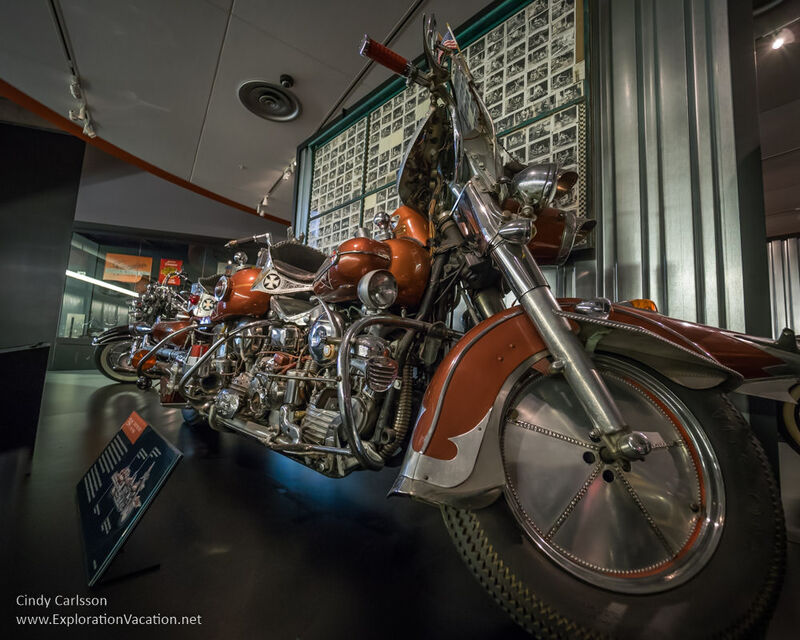 Who needs a history book when the Harley-Davidson Museum in Milwaukee, Wisconsin, lays it all out for you one bike at a time? Harley-Davidson’s story begins with the 20th century itself, in 1901. That’s when 21-year-old William Harley drew up plans for an engine designed that could power a bicycle. (Bicycles were wildly popular at the time.) Two years later, in partnership with childhood friend Arthur Davidson, the first Harley-Davidson motorcycle was sold out of the wooden shed that served as their factory. Those early motorcycles were largely sturdy, unglamorous machines designed to run in tough conditions on primitive roads – and they look it. While not beautiful, those rugged motorcycles were perfect for use by delivery services, police departments, and the military. So, while some were still used for racing (apparently Harleys have always been a top choice for racing), many others were hard at work. In 1918, as WWI came to a close, almost half the motorcycles produced by Harley-Davidson were purchased for military use. By 1925 all Harley-Davidson motorcycles had the tear-drop shaped gas tank that makes them so recognizable. And, with war duty behind them, the bikes were beginning to look sleeker. Harley-Davidson introduced their famous “flathead” engine in 1929 (an engine so famous even I had heard of it before going to the museum). That would have seemed like bad timing, with the market crash later in the year, but they kept going, producing motorcycles both for sport and for work through the 1930s. This is my favorite era, because the latter half of the 1930s brought swoon-worthy styling and gorgeous tank graphics to the motorcycles Harley-Davidson produced. The 1930s eventually became the 1940s and, as the world once again slid into a World War, Harley-Davidson was back producing motorcycles for military use. 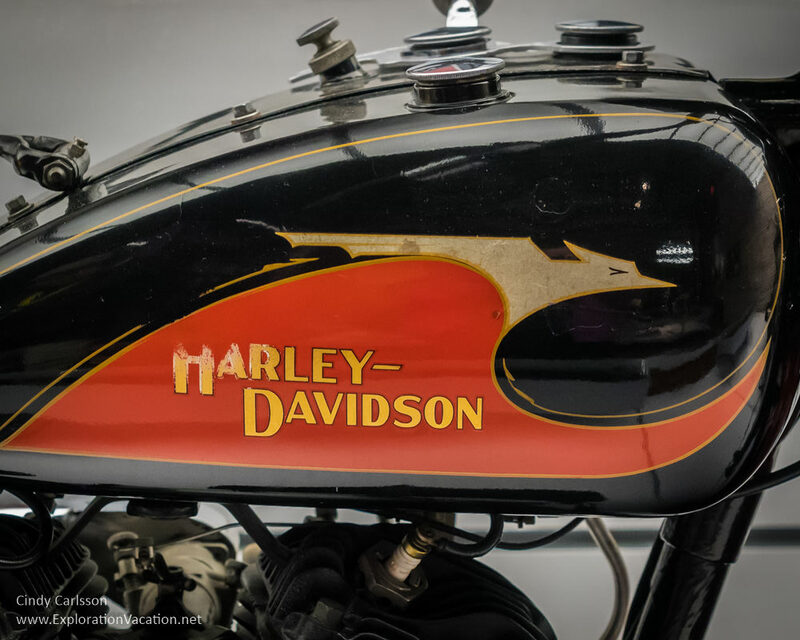 During WWII Harley-Davidson produced almost no motorcycles for civilian use, however, once the war ended, they didn’t waste any time getting competition-destroying racing bikes back into production. The 1950s seem to have been kind to Harley-Davidson, with a new factory and an ever-expanding number of dealerships. Customization began to take off during this period as well. While customization had always occurred, it became much more common at the end of the 1940s when soldiers struggling to integrate back into society began to create their own motorcycle-centered society with its own style and rules. Soon the popular media began creating a mythos around these “outlaws” (and motorcycle culture in general) through films like the Wild One and Easy Rider. In 1981 Harley-Davidson was purchased from AMF by a group of senior executives, making it an independent company once again. It seems likely this saved the brand from disappearing entirely, as did the decision to focus on producing heavy retro bikes with lots of emotional allure instead of competing directly with the popular Japanese models. The decision to actively encourage and build loyalty groups didn’t hurt either, as Harley owners seem to be a particularly loyal bunch. 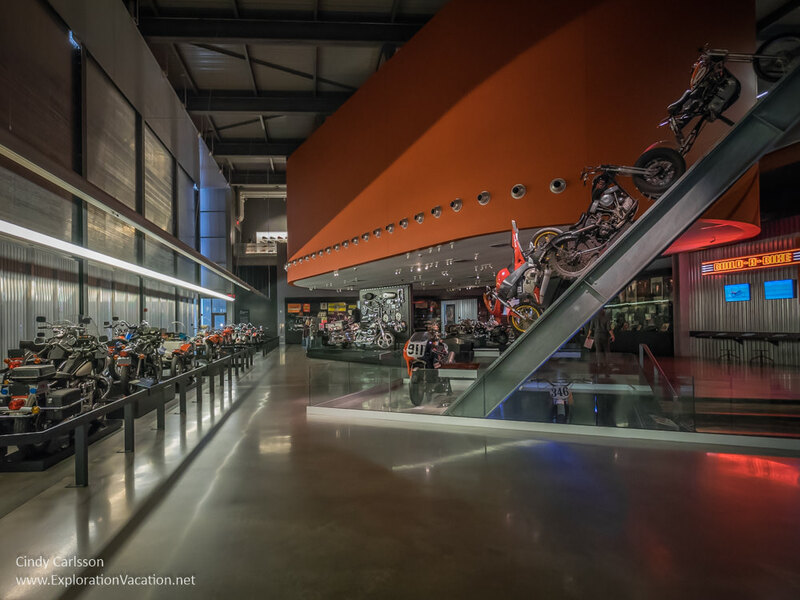 The Harley-Davidson Museum is located in a sprawling complex at the edge of downtown Milwaukee. While much of the museum displays the company’s collection of historic Harleys (from 1901 through today) in the Motorcycle Gallery, there are also large exhibits related to Clubs and Competition (Harleys have a long history as racing bikes), an Engine Room exhibit that’s all about the engines and other parts that make a Harley run, a Design Lab that explains the design process, an Experience Gallery where you can sit on a Harley, and a variety of special exhibits. Along with the museum (which displays hundreds of motorcycles and artifacts), the complex includes a restaurant, large gift shop, and plenty of parking. The museum is open daily except for some holidays. At the time we visited, admission ranged from $14 to $20 per person and photography was allowed throughout the museum. I’m not ordinarily the Harley type, but when the helpful folks at Visit Milwaukee said I really needed to see the Harley-Davidson Museum, I was wise to listen to them. I expected to take a brief run through the museum – instead we spent the entire morning and still didn’t quite see everything of interest. I visited the Harley-Davidson Museum as a guest of Visit Milwaukee, but all opinions expressed here are my own. 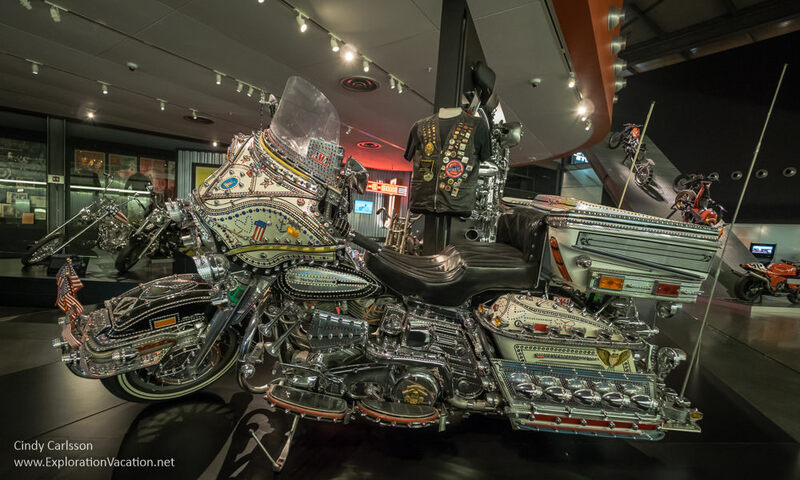 I’m not a big motorcycle fan either but the Harley-Davidson Museum looks really interesting. Love the wall of tank art designs and the heavily customized bikes. Guess it’s time for a visit to Milwaukee! We loved the tank art wall – it’s really funny to see how well they usually matched their graphics to the zeitgeist of each age. The history displays were pretty interesting too – lots of interesting things about how business and commerce worked back in the day when transportation options were limited. I remember seeing a photograph of my grandparents on a Harley Davidson after they got married in the 1920s. It looked very glamorous! 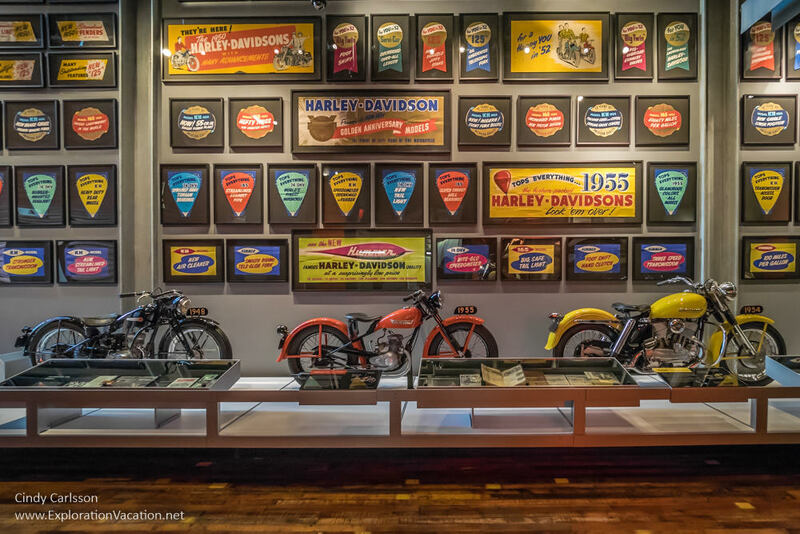 Terrific photos of the Harley Museum in Milwaukee. We visited a while back and I’m not a motorcycle fan but the museum is so much more than that as you’ve pointed out. The American history lesson and the history of this iconic brand is fascinating. Thank you. It was a challenging place to shoot (dark! ), but with cool stuff. I’m glad I was encouraged to go there – I wouldn’t have otherwise, which would have been a loss. These are greathe quality photos and the history behind the bikes are informative. I think it’ll be a good idea to share your post with colleges. Wow. Thank you. I had never really thought about colleges before – what a fun way to get students to think more broadly about history! Personally I’m not a fan of motorbikes, hence I never noticed the change in the Harley Davidson logo design – very interesting! All I know is that the initial design flaw has never been rectified: the second cylinder of a Harley Davidson engine sits behind the first, thus it gets less cooling air flow and often overheats. 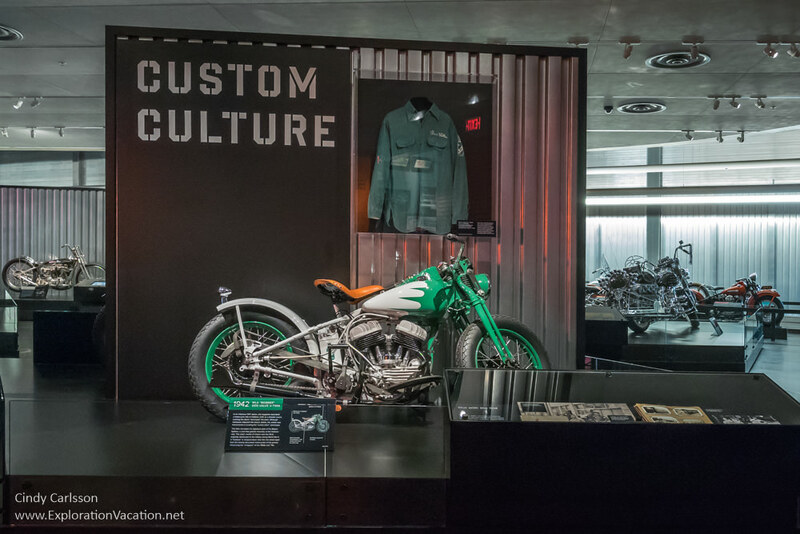 This museum looks beautiful and I certainly would visit if on my way – I just wouldn’t go out of my way for it since, alas, I’m not that interested in motorbikes. I love your comment on the engine design – NOT exactly how it is portrayed at the museum  Yes, I get the “not that” interested in motorbikes – me neither. I mostly think of them as noisy obnoxious things (and my dad was an Indian motorcycle fan, so I didn’t grow up with Harley mythology either), but some of the older tank designs are fabulous. It was fun to see the various roles they have taken on throughout history – lots of transport issues I’d never thought of, as well as the cultural role. They’ve done a nice job with the museum — I like that it was interesting even for non-motorbike people. I had never heard of this before and what a fun tour you took me on. While I am not a Harley fan club member or bike enthusiast, I would like to see this . . .what a great look at history! Happy to take you along! Thanks for joining me.